I'm back with more cookies! There are so many reasons that Christmas is my favorite holiday but the fact that there are cookies specifically dedicated to it is definitely a contributing factor. If there were President's Day cookies I would probably count down the days to that too. Maybe I'll start that trend when February rolls around but for now I'll stick with Christmas cookies. 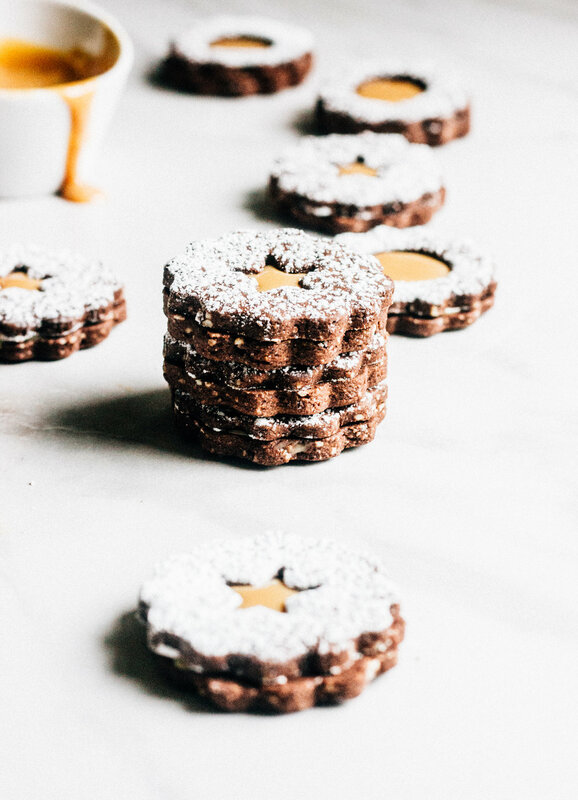 Yesterday I told you how great linzer cookies are with all of their toasted nut, fruit filled magic but today I am adding chocolate and getting rid of that whole fruit thing in the name of the world's most magical filling of all: dulce de leche. Dulce de leche is sweetened condensed milk that is cooked and cooked and cooked some more until it turns a deep caramel color and starts to taste like a whole lot more than that mysterious white stuff that comes in a can (or a 25 gallon bucket if you work at the bakery). It's basically a super smooth and creamy caramel sauce that is unbelievably rich and delicious. AKA, you should probably start knocking out a batch of it right now. Luckily, it is super easy to make. Peel all the labels off of a can of sweetened condensed milk. Place the can in a large pot and fill with water at least 2 inches above the can. Let the water come to a simmer over high heat, then reduce the heat to a very light simmer and let it cook for 3 hours. Keep checking it every so often, adding water as necessary to make sure the water level is always 2 inches above the can (otherwise it could explode. No big deal.) If you want a lighter caramel, take it out after 2 hours but for a full fledged dark caramel, go for the full 3. Remove it from the pot with tongs and let it cool completely. Completely, for real. (That whole exploding thing again.) And that is all there is to it. Really though, don't let the exploding can thing scare you off. If it's submerged in water, you're golden. Best of all, these cookies only use a small bit of the sauce, which leaves you with a can of homemade dulce de leche for putting in coffee, over ice cream, in frosting, in whipped cream, on toast, eating straight off the spoon....whatever your heart tells you. Just let the first use go to these chocolatey, toasted almond cookies. You won't be sorry about that ever. Note: You can buy premade cans of dulce de leche but it is also ridiculously easy to make on your own. I explain how to do it in the post above and if you can boil water, you've got this. But making it yourself is always way cooler and just as easy. You can find great instructions here or here. Toast almonds in a small dry skillet over medium-high heat. Cook, stirring often, until they turn golden brown and smell nutty. Rub the nuts in a kitchen towel to remove any loose skins, then transfer to a food processor. Pulse the almonds and 1/4 cup brown sugar in a food processor until finely ground and sandy. In the bowl of a stand mixer, cream the butter and remaining 1/4 cup brown sugar until light and fluffy, about 3 minutes. Add in the nut mixture and beat 1 minute longer. Scrape down the bowl and beat in the vanilla and egg until well combined. Combine the dry ingredients in a separate bowl, whisking to combine. Add the dry ingredients to the mixer and mix on low until just combined. Form the dough into a ball and flatten into a disk. Wrap the disk in plastic wrap and place in the freezer for 20 minutes. Preheat oven to 350. Line 2 baking sheets with parchment or non-stick baking mats. Roll out the chilled dough on a well floured surface to between 1/8"-1/4" thick. Using a round cookie cutter, cut out as many cookies as you can and transfer to the prepared baking sheets, leaving an inch of space between each. Using a smaller round cutter, or any shape you choose, cut out the center of half of the cookies. Bake 10-12 minutes. Reroll the remaining dough and repeat the process. Once the cookies are cooled, spread a spoonful of dulce de leche on the bottom side of a whole cookie. Sandwich together with a cut out cookie. Make sure not to add too much filling or it will ooze out the sides. About 1 tsp. in the center of a large cookie should do the trick. Repeat with remaining cookies.